I've had the same glasses since my sophomore year of college. My eyes have gone through so many funky changes with my pregnancies I just didn't see the point in getting a new pair if my prescription was just going to change again. Then I discovered Warby Parker. And THEN I discovered their fall line. Be still my heart. Their new line of glasses reminds me of jumping in leaf piles (which I have done before despite living in AZ most of my life), football games, and pumpkin spice lattes. Maybe I wouldn't have to wear fake hipster glasses anymore. Maybe, just maybe I could actually have a real pair of hipster glasses. 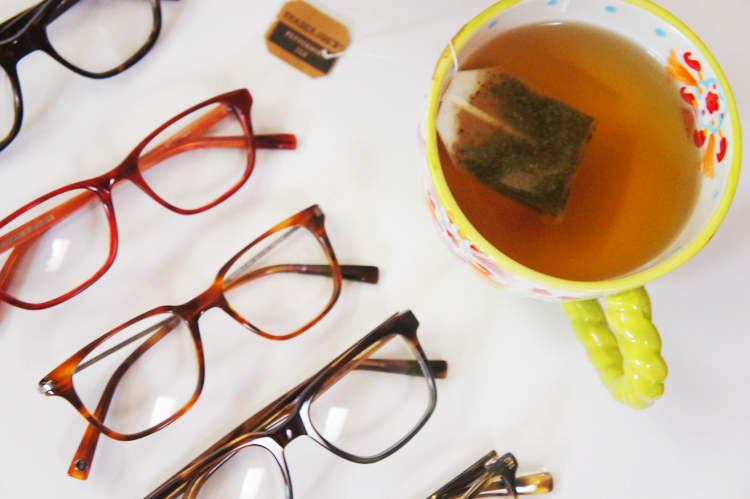 Online I browsed through many gorgeous glasses and then narrowed it down to five pairs. Lucky for me, Warby Parker has this sweet take home program where you have five days to try on your favorites and decide which ones you want. Super easy right? Wrong. Because for me, that just meant I wanted all five and I had no idea how I could possibly choose. That's why husbands are such a wonderful thing to have! Andrew helped me narrow it down to the top three. Now I need your help! Which pair should I choose?! I styled the three different pairs with fall inspired accessories i.e. flannel scarves, fuzzy sweaters, and snazzy blazers. So help me choose! Quick, before my prescription changes again!